The gleam of steel and the brilliance of diamonds blend sport and elegance in the WJ1317.BA0573 Tag Heuer Link Women’s Watch. 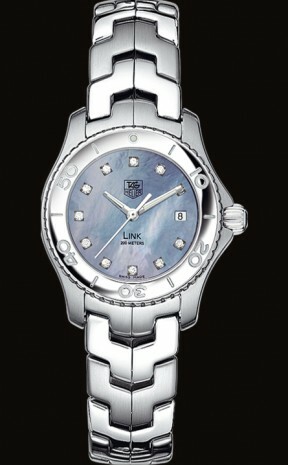 The modern high-tech character of this ladies’ Tag Heuer Link watch complements the smooth ergonomic design, and the blue mother-of-pearl dial softens the effect for a fluid, feminine profile. Ideal for the woman with an active lifestyle, this timepiece represents a perfect balance of outdoors and luxury. The WJ1317.BA0573 Tag Heuer Link Women’s Watch features a case cut from a single premium steel block and polished to a brushed shine. The 27-milimeter case seamlessly integrates into the signature brushed steel link bracelet that is secured with a double-locking clasp and a folding buckle. The dial, protected by a curved scratch-resistant sapphire crystal, is studded with eleven Top Wesselton diamond hour markers, and includes facet-cut luminous silver-toned hands and three chronograph sub-dials surrounded by a unidirectional turning bezel. A window at the 3-o’clock position denotes the date. Powered by precision Swiss quartz movement, the WJ1317.BA0573 Tag Heuer Link Women’s Watch is water-resistant to 660 feet (200 meters). This striking timepiece is the perfect accompaniment for the action-oriented woman; it makes a powerful impression while softening the edges. 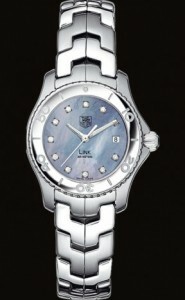 Available at authorized Tag Heuer retailers. I like your structured way of describing the watches. This is a fine example of acute detail and precise terminology – great read!